As a homeowner, you might want to shake things up outdoors in your yard or front lawn with some great landscape design projects. If you are having difficulty coming up with ideas, you can benefit from some design tips. For inspiration, you can rely on the best landscape design apps available for the iPhone or Android smartphones. These are great if you are interested in getting an excellent landscape, and as a result, you can show your ideas to a landscape design contractor who can bring your designs to life. iScape Free is useful in helping you get a better idea about what landscaping design would work well for you. It is easy to use and requires you take a photo of your garden or front yard with your phone’s camera. From there, you can create your vision by designing over the image within the app. It is user friendly and has features that include a virtual pen, the ability to insert objects and more. This is considered one of the best landscape design apps. The free version is meant to give you a chance to test drive, so to speak, in case you would want the paid version. Reviews for iScape Free are fair, but most users have rated it as excellent. One of the top apps to assist you with your plant landscaping in your garden is Landscaper’s Companion. It is a comprehensive database of information on more than 26,000 plants and 21,000 photos. Whether you are a casual or serious home gardener, seasoned or novice landscaper, you can get all the information you need on any plant you have your eye on and are considering planting on your property. You will find it to be one of the best landscape design apps. Reviews by users are mixed but mostly fair to good. Houzz is one of the most popular landscape design apps and websites right now. It’s a greta resource for finding a contractor and designing your perfect home, both inside and out. While the app is most commonly used for interior decorating, it also has an extensive outdoor decorating and designing section that can held you create your dream yard. The Houzz app features verified product reviews as well as more than 16 million high-res photos of both interiors and exteriors to give you great design ideas for your home. You can also use the app to find home improvement professional like contractors and repair professionals. In addition to these great features, the Houzz editorial staff and design experts keep you up to date on the latest industry trends, news, and advice in their articles and newsletters. The Houzz app and website are highly respected and very popular. The app has excellent ratings. Home Outside is a great landscape design and planning app that really does make landscape design available and accessible for anyone. The tap-and-drag functionality is easy to use and you can choose from over 700 elements in 29 different palettes to design your dream home and yard. There are many different tools available within the app including a sketch tool which allows users to draw garden beds and other free-form shapes and a map tool which allows you to import an image of your home from Google Maps. You can also import a photo as the background so you can design on a digital image of your property plan or layout. Home Outside is one of the deepest and most customizable landscape and home design apps on the market right now. It has excellent reviews from those who have installed it. 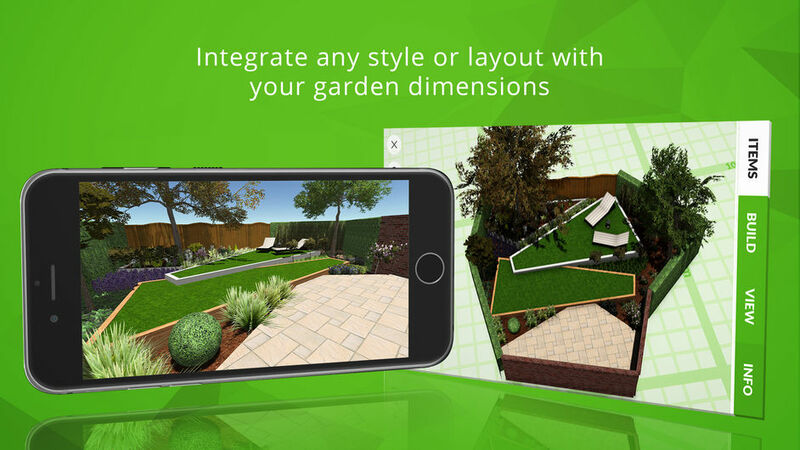 Home Design 3D Outdoor & Garden is a simple, intuitive and comprehensive app that boasts all the features of the original Home Design 3D but this time for outdoor spaces like yards and gardens. You can select the exact dimensions of your yard, drag and drop over 200 outdoor design items, and instantly see the result in 3D. While this version is free, there is a paid version available for purchase within the free app for $4.99.This will unlock more features plus the ability to save your design. In addition, the app is updated often to fix bugs and add new features. 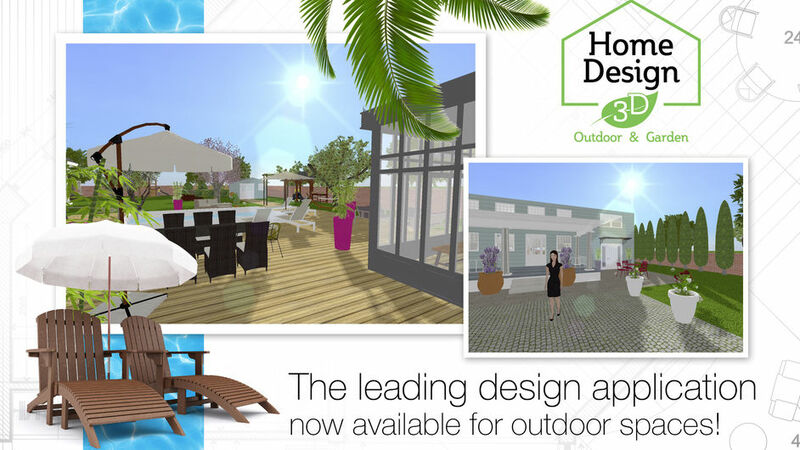 Home Design 3D Outdoor & Garden has a lot of downloads and maintains a great rating. PRO Landscape Home is similar to apps listed above in that it lets you import or take a photo of your home and use elements from its extensive library to edit your photo. It’s quick and easy to see how your home would look with these elements included. You can add photos of shrubs, trees, flowers, and much more to create your dream landscape right on top of the photo of your own yard. You can also easily resize any item and create custom areas like grass, mulch, and pavement. While PRO Landscape Home has a free version, you can purchase the larger image library for a one time fee of $14.99 if you want more variety in your designs. While this app doesn’t have great reviews, many of the lower reviews are due to the high price of the larger image library. If you take this app for what it is, you can have a rewarding experience. This app was created by the leaders in lawn care products, Scotts. Simplify your lawn care by creating an easy-to-follow lawn maintenance plan so you know exactly what products to use to keep your lawn looking great. The app is easy to use and give your personalized recommendations based on your grass type, location, lawn size, seed, feed, weed, and weather conditions. Within the app, you can also purchase the products you need to care for your lawn for the rest of the season with free shipping. In addition, you create multiple lawn plans if you have different conditions on different sides of your home or in different homes altogether. You can also have a live chat with a Scotts representative to ask about products and lawn care. Learn everything you need to know about lawn watering, seeding, feeding and care from the experts at Scotts. This app has great ratings from most of the users who have downloaded it. Without a doubt, one of the best landscape design apps for the iPhone is Garden and Landscape Designs. There is a database full of gorgeous landscaping and gardening images, all of which include detailed information on the designs. 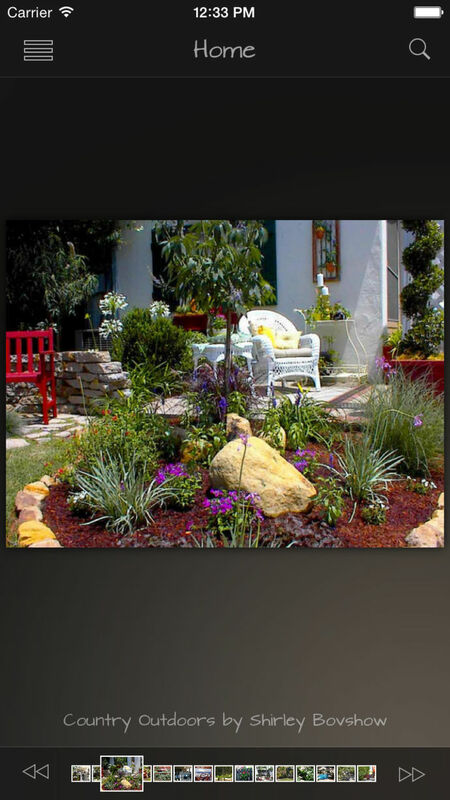 You can gain inspiration for your own landscaping projects from the app and even use it when your phone is offline. It is a fairly new app but is well worth checking out. There’s not a whole lot to this app other than the photos that provide you with landscape ideas, but they are some incredible photos. This is a great app to check out if you’d like to get inspired about adding to your yard or landscaping fixture and want some creative ideas to spruce up your home. It doesn’t seem to be too popular at the moment and doesn’t have any reviews so temper your expectations. You can now make your dream garden design come to life in virtual reality with VR Gardens. This app is the world’s first 3D garden design planner. You can try your hand at landscape design with hundreds of different types of plants, flowers, and structures. The best feature of this app is that when you’re done designing your perfect yard, you can take a stunning virtual reality tour of it with your phone. Step right into the beautifully landscaped yard that you designed from scratch and see what it would look like in real life. This app has mixed reviews from users. If you have a green thumb and you’re looking for an app to help you plan out the perfect garden, Planter is the perfect app for you. This app is great for both beginning gardeners and those with lots of experience. You can arrange your entire garden and also learn how to grow every type of vegetable. This app features a square foot gardening grid that makes it easy to organize your garden. It also features a scheduler so you can set reminders of when to plat or transplant your items. 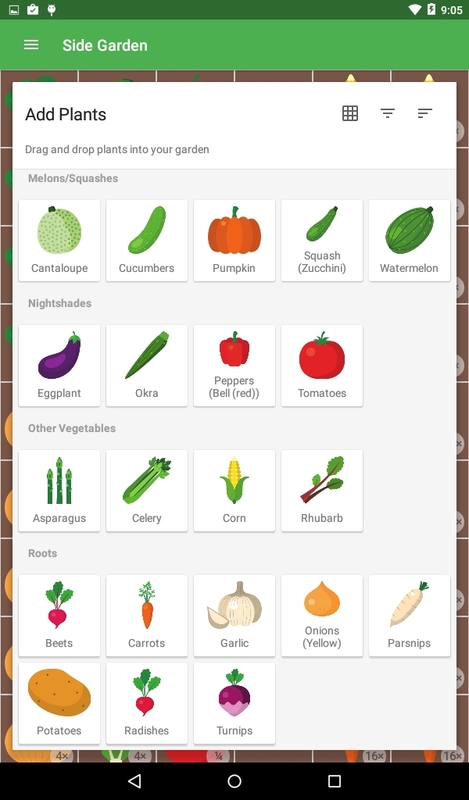 There are over 50 fruits and vegetables included in the app and more are being added all the time. You also have the ability to add custom plants into the app if your favorite thing to plant isn’t included yet. They’re also always working on new features to add to the app so you will always have new things to do and plants to explore.